Pilots need active support from air traffic control to fly safely. Air Traffic Controllers (ATCOs) are also essential to the efficiency of airports and the airline industry. With the ever-increasing volume of traffic, managing flights is a complex and sometimes pressurised job. As an ATCO, you’ll be using radar and other technology to track planes ‘en route’ between airports and keep in touch with pilots. Alternatively, you’ll be liaising with the planes on approach. If you’re in charge of the airspace between airports, you’ll be called an Area or Terminal Controller. And if you’re helping pilots land, the role is described as an Approach or Aerodrome Controller. Air Traffic Controllers (ATCOs) are essential to the efficiency of airports and the airline industry. 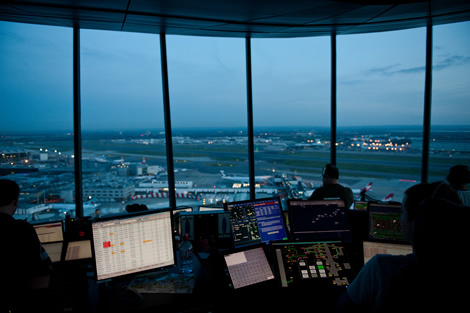 You’re likely to be based in one of our area control centres, although you might also be located at an airport tower. These roles will see you handling domestic traffic and planes flying through UK airspace. Our Controllers at Swanwick deal with flights approaching London airports and those at Prestwick are responsible for aircraft flying across the Atlantic. As an Approach Controller, you’ll be working at an airport, often in a Control Tower and guiding planes on approach, ensuring they’re ordered in the most efficient way. The job of the Aerodrome Controller is to take over as they come into land. At a large airport, this role may be split between traffic that’s in the air and planes that are already on the ground. It’s not possible to say there is one particular type of person who makes an ideal ATCO. People apply – and are accepted – from all kinds of backgrounds. These online games will give you a sense of whether you might have the right kind of aptitude and skills for the role. They reflect the need to work under pressure, think in three dimensions and process information quickly and accurately. There are also strict rules about who is eligible to apply. But if you think you might have the skills, and are eligible, then please explore the other pages in this section and think about applying. Meet a Controller There’s no one better qualified to talk about the role of an Air Traffic Controller than those who do it. Do you have the skills? Shape tracking, sequential memory, reactive avoidance - do you have Controller skills?